The following guide shows how to do lossless Blu-ray to MKV backup on Mac with all audio/subtitles tracks and chapters preserved. If you are looking for such a solution, just feel free to check it. 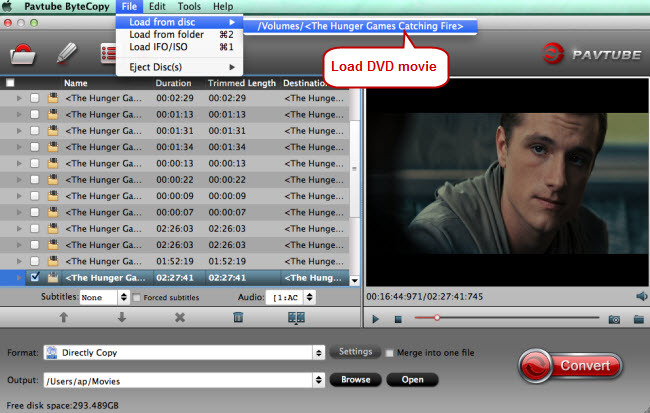 Pavtube ByteCopy for Mac is specially developed for Mac users to create MKV files from recently released Blu-ray and DVD movies with lossless quality. By using this Mac tool, users are able to preserve all audio tracks/subs streams/chapter information in a single MKV file, and meanwhile keep videos in 1080p quality at original 16:9 aspect ratio, and audios in original HD quality (TrueHD audio, DTS-HD Master Audio…) without any quality loss. Pavtube ByteCopy for Mac is fully compatible with Mac OS X macOS Sierra, OS X El Capitan, Yosemite, etc so you don't worry the system compatibility issue. Step 1: Free download Pavtube ByteCopy for Mac, install and run it on your Mac computer. Connect the external BD drive to your Mac, and then insert the Blu-ray disc to the drive. Launch Pavtube ByteCopy for Mac, and click “Load from Disc” icon in the top left corner of the main interface to load your Blu-ray movie from your external BD drive. After the loading process is done, you will see all titles in the BD movie are showing with main title checked by default only. If you wanna backup main title and all bonus features to MKV, you need to select all titles. If not, the software will backup the main title only. 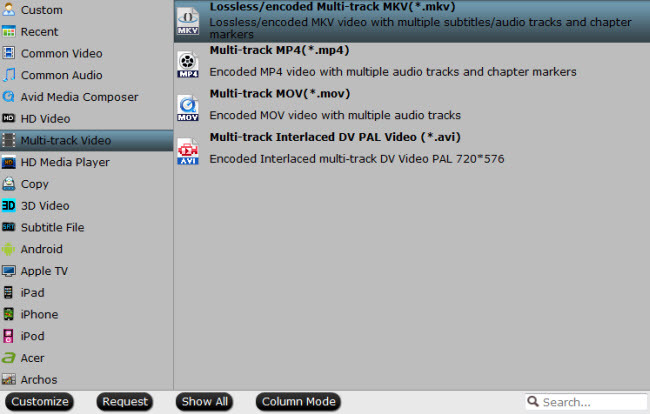 Step 2: Click the format bar to follow “Multi-track Video” ＞ “Lossless/encoded Multi-track MKV (*.mkv)” which well preserves chapter markers and multiple subtitles/audio tracks. Tip: Here, you can click "Settings" to set your subtitle and audio. When you rip Blu-ray to lossless MKV, you are allowed to keep multiple subtitle and audio tracks. Just choose what subtitle you want and check the streaming. Step 3: Click “Browse” button to specify where to locate the output MKV files. Click “Convert” button to start lossless Blu-ray to MKV backup on Mac. When the bluray backup on mac is finished by Pavtube ByteCopy for Mac, you can click “Open” button to get the final output MKV files with all audio/subtitles tracks and chapters preserved. Hope this helps. Backup BD/DVD to MKV on Mac with lossless quality/keep BD videos in 1080p quality at original 16:9 aspect ratio. Allow full preservation of all audio tracks (like DTS HD Master Audio, Dolby TrueHD Audio, etc. ), subs streams, and chapter markers. Remove unwanted audio tracks/subtitles streams, and only keep the one(s) you need. The output MKV files are compatible with lots of HD Media Players and Mac Players, like WD TV HD Media Player, Popcorn Hour C-200, VLC media player, MPlayer and more.